Snowpiercer is a very, very good movie. It's not an original concept, though, being based on 1982 French comic Le Transperceneige. Which, despite being regarded as something of a cult classic, has only now been translated into English. Titan has translated and published not just the original Le Transperceneige, but its 1999 sequel (which was actually done by a different writer, since original author Jacques Lob died in 1990). I've just got done reading them and, well. The original, which the movie is mostly based on, is fantastic. 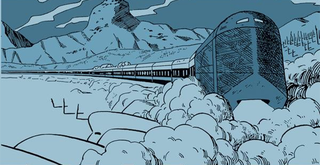 It's a bleak tale that's much more personal than the film, ditching much of the supporting cast to focus on a pair of characters who slowly make their way up the entirety of the titular train (which in the comic is much larger). The further up they go, the more bizarre and hedonistic the lifestyles they encounter. I'm not going to describe much more of the plot, or how it differs from the movie, since what they find at the front is a bit of a spoiler (and it differs from the movie). I will say, though, that in keeping with the tradition of French sci-fi comics, it still looks fantastic, with a design that's almost timeless. It's also strangely relevant; published in France, in 1982, you can see the political tensions of the time bleeding through into the pages.. Ten years after publication it might have come across as a little too dark, but in today's world, where issues like a widening gulf between the rich and poor and climate change are becoming increasingly pressing, it comes across as weirdly modern. The sequel is...less enjoyable. Built upon the ridiculous premise that there's a second Snowpiercer, one that the first train somehow never knew about, it deals in many of the same themes and issues (albeit with a heavier emphasis on the politics of the train), only with the extra perspective that this Snowpiercer has special suits that let people make short expeditions outside. It's both a bit too silly and a bit too similar to the original to be anywhere near as good, but between the expansion of the universe and one hell of an ending it's worth a look if you end up loving the first so much that you need more.